Our standard Zeta Armor Handguard Package has been very popular with dual sport/off-road riders, and works great for the vast majority of our customers, but if you're looking for the best and most durable handguard setup, look no further than our Zeta PRO Armor Handguard Package. NOTE: These hand guards come with inserts designed for handlebars with a 13.5mm - 14.55mm diameter opening in the end of the handlebars. This usually means aftermarket aluminum handlebars which typically use thicker walled tubing and have a smaller opening on the end. Please measure your handlebar end opening prior to ordering. SIDE MOUNT TYPE can be used to attach handguard to the top triple clamp on motorcycles with top triple clamp fork bolts attached from the side. FRONT MOUNT TYPE can be used to attach handguard to the top triple clamp on motorcycles with top triple clamp fork bolts attached from the front. LONG CLAMP TYPE can be used to attach handguards to your handlebars. The longer clamp length will help the handguards clear larger front brake master cylinders found on some street bikes. BC MOUNT Type designed to attach handguard to handlebar mount on off-road and trail bikes. Prevents rotation of hand guards and protects your control levers and throttle in the event of a fall. Zeta PRO Armor Hand Guard Color: Choose the color for the aluminum Zeta PRO Armor Hand Guards (you get one pair). Colors currently available are Anodized Black, Titanium Silver or Orange. 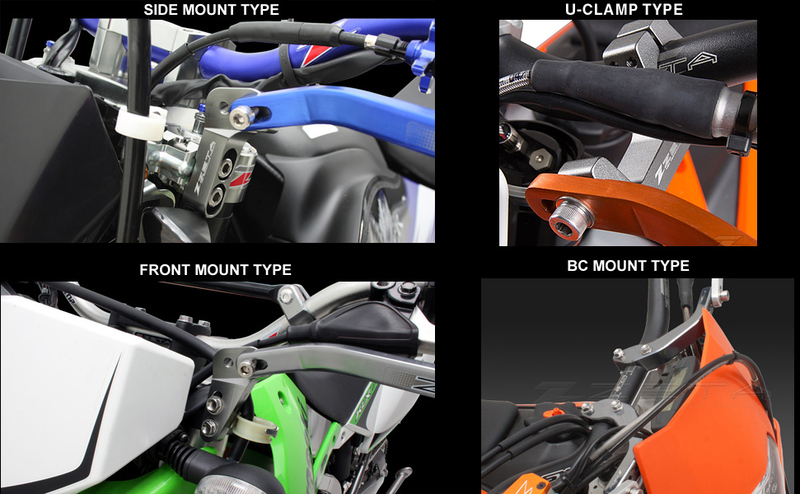 Zeta PRO Armor Hand Guard Mount Kit: Choose which Hand Guard Mount Kit you want for your bike. SIDE MOUNT TYPE will work on bikes like the Honda CRF450L, Yamaha WR250R/X and Suzuki DRZ400S/SM, which have their top triple clamp fork bolts attached from the side. FRONT MOUNT TYPE will work on bikes like the Honda CRF250L, which have their top triple clamp fork bolts attached from the front. U-CLAMP TYPE and LONG CLAMP TYPE will work for attaching handguards directly to your handlebars. They come in either 7/8" or 1 1/8" size. BC MOUNT Type is designed to attach handguard to the handlebar mount on trail and off-road bikes. Zeta XC Protector Style & Color: Choose "None" from the drop down below if you don't want the plastic Zeta XC Protectors. Otherwise, choose whether you want the Standard plastic Zeta XC Protectors or the slightly larger plastic XC PRO Protectors, and the color you want. Current color options are White, Red, Blue, Black, Yellow or Orange (XC Pro only available in White or Black). Zeta XC Protector LED Flashers: Choose "None" from the drop down below if you don't want the integrated LED flashers. Choose "Yes" if you want the Zeta XC / XC PRO Protectors with integrated LED turn signals mounted into the plastic protectors (all wiring is included). Available LED lens color options are amber (orange) or smoke. SPECIAL NOTE: If you order these hand guards with optional integrated LED Flashers, and want the LED's to also operate as running lights, you may want to order our 12oClockLabs Running Light Adapters.